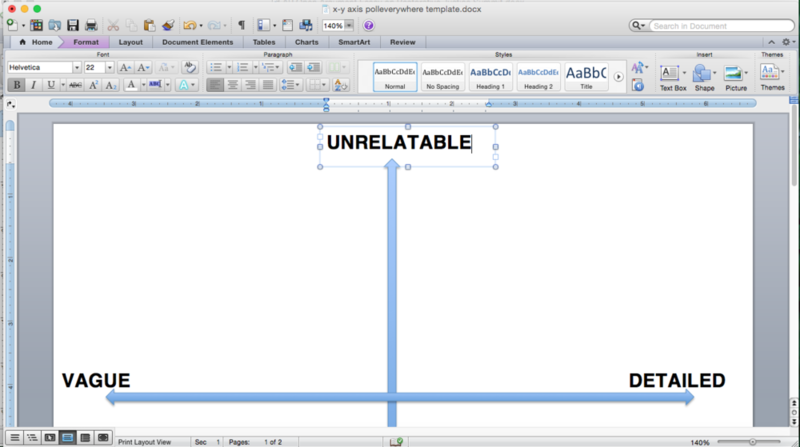 Using directional arrows and some text boxes in Word, I place oppositional words at the top and bottom of the y-axis and left and right of the x-axis. I take a screenshot, and then upload the .jpg as a clickable image to PollEverywhere. I make the poll full-screen and project it for student view. Students can navigate to the poll on their smartphones or computers. You can allow them to drop multiple pins, but for this exercise, I limit them to a single pin. They read the question and drop a pin. Was the keynote speaker very relatable but just a bit vague? Was she hyper-detailed but not relatable to the teenage audience? Students share their screens with a nearby peer or two and justify the exact placement of their pin on the x-y axis. I invite students to share their answers in pairs or triads for just 2-3 minutes before returning to the large group. I then ask students to share the profits of their small group discussions. You may even ask them to predict where most of the pins will appear when you unfreeze the poll. Perhaps a particular quadrant. PollEv allows you to designate a square as the "correct" answer if you wish. PollEverywhere has a button that allows you to reveal or conceal the dropped pins, so a teacher can either "freeze" the screen (using the remote for the projector) or simply select the pin icon to show/hide the dropped pins. Here are some examples from this week of teaching. Notice how clustering of viewpoint may occur. Students can be randomly called upon to stand and justify their pin's placement. 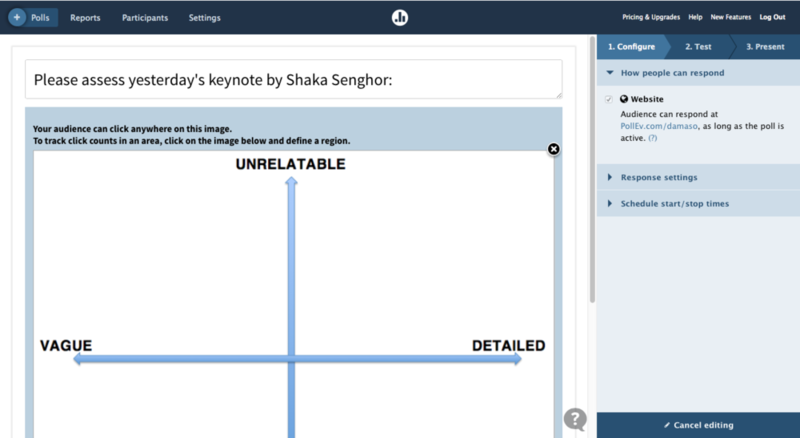 Students could move to the four quadrants of the classroom to represent the quadrants of the coordinate axis graph and continue the conversation that way. Letter from a Birmingham Jail by Dr. Martin Luther King, Jr.
How do you use continua or scatterplot data to help students investigate the grays of seemingly black and white questions?